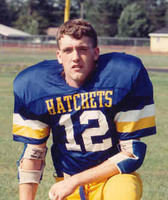 A graduate member of the Tomahawk High School Class of 1991 participating in football, hockey, track and baseball. During his sports career, Jesse earned twelve letters in the fifteen sporting seasons that he participated in. Conference honors included First Team All Conference in football as a senior, All Conference Honorable Mention as a junior and senior in hockey, Second Team All Conference as a junior and First Team All Conference in track as a senior, First Team All Conference as a junior and All Conference Honorable Mention in baseball as a senior. Jesse received the Gary Kuntz Memorial Award as Top Male Athlete in 1991. As a senior, Jesse was selected as team captain in hockey, track, and baseball. He was part of a conference football title his junior year and part of a team that was one game away from a trip to state his senior year. In 1991, Jesse was regional champ in the shot put. He also was part of two regional baseball titles and one hockey regional title, as well as being a member of the state hockey and state baseball teams in 1991. Jesse was quite a versatile athlete since he played quarterback, tailback, and defensive back in football, played both offense and defense in hockey, played both right and center field in baseball and threw the shot put and discus, particioated in the triple jump, and was part of the 4x100 Meter relay team in track. After high school, Jesse graduated from UW-Stevens Point where he earned a degree in psychology and sociology. CurrentlY, Jesse is employed by Chaney Systems, Inc. in Madison as a computer specialist.